Publication | Defining Flood Zone Transitions in Low‐Gradient Coastal Regions – Matthew V. Bilskie, Ph.D.
M.V. Bilskie & S.C. Hagen (2018). “Defining Flood Zone Transitions in Low-Gradient Coastal Regions.” Geophysical Research Letters, In Press, doi: 10.1002/2018GL077524. Abstract Worldwide, coastal, and deltaic communities are susceptible to flooding from the individual and combined effects of rainfall excess and astronomic tide and storm surge inundation. Such flood events are a present (and future) cause of concern as observed from recent storms such as the 2016 Louisiana flood and Hurricanes Harvey, Irma, and Maria. To assess flood risk across coastal landscapes, it is advantageous to first delineate flood transition zones, which we define as areas susceptible to hydrologic and coastal flooding and their collective interaction. 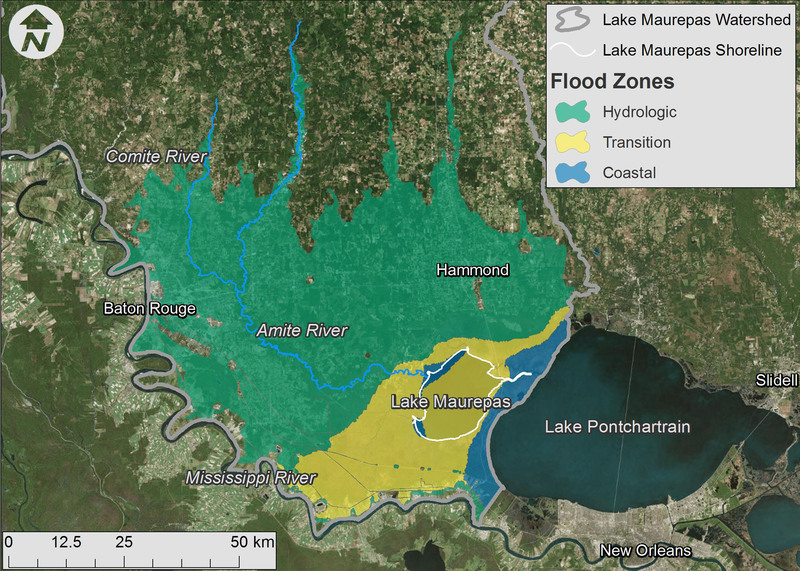 We utilize numerical simulations combining rainfall excess and storm surge for the 2016 Louisiana flood to describe a flood transition zone for southeastern Louisiana. We show that the interaction of rainfall excess with coastal surge is nonlinear and less than the superposition of their individual components. Our analysis provides a foundation to define flooding zones across coastal landscapes throughout the world to support flood risk assessments.